The Home-Stay or 'surfstay' is built in a traditional Balinese style, carefully constructed in order to not only keep its traditional taste but to get the maximum comfort for occupants. 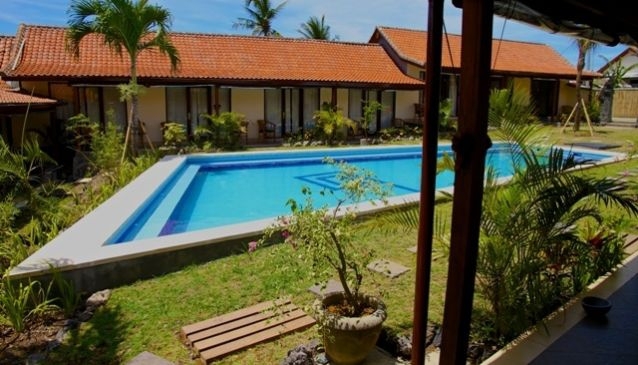 The hotel has 15 rooms fully equipped with air conditioning, Wi-Fi, separate bathrooms with hot water and large common areas with cable TV, kitchenette and outdoor pool. The concept is to provide any traveller, whether 'low budget', limited budget, or a demanding tourist, an unparalleled quality accommodation. There is also a 'Suite' room for stays of medium or long term. Services: Airport transfers. Motorbike rental. Car rental. Sports photography for your surf sessions. Massages. Laundry. Balinese wedding. Surf lessons. Canggu is one of the few treasured secret areas of Bali. Its pristine rice fields and quiet beaches retain their original beauty in the rough, though just 20 minutes from the bustle of Kuta.